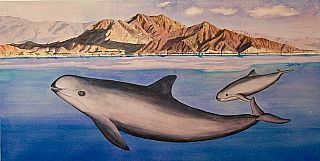 Vaquitas are down to the last few individuals of a species that has lived in the Gulf of California for 3 million years. The problem seems easy, ban gillnets and the species is saved. The solution has proven too hard. Fishermen have to change their livelihoods. In short, changing people’s behavior takes longer than most marine mammals that only live near humans have left. This talk summarizes what happened with vaquita conservation and considers what hope remains and what could be done differently next time. Ex-situ conservation (maintaining animals outside their natural habitat) for dolphins and porpoises is considered as a possible conservation tool to help bridge the time gap between the count-down to extinction and the slow pace of humans learning to live sustainably. Dr. Barbara Taylor has been researching marine mammals for over 30 years. She works at the Southwest Fisheries Science Center in La Jolla, California USA. She now leads a group of scientists identifying units to conserve using genetic data and has promoted developing guidelines and standards to facilitate naming new taxa of cetaceans using primarily genetic data. She also specializes in estimating risk of extinction and has worked with some of the most endangered species. She is member of several endangered species recovery teams, and has served on many status reviews of species petitioned for listing, chairs the Conservation Committee of the Society for Marine Mammalogy, and serves as the Listing Authority for the Cetacean Specialist Group of the International Union for the Conservation of Nature (IUCN). In 2006 she participated in the survey that failed to find any baiji, the Chinese river dolphin, portending the first human-caused extinction of a dolphin or whale (cetacean). As a result, she is actively working with other conservation scientists to prevent the extinction of what now becomes the most critically endangered cetacean: the vaquita, or Gulf of California porpoise, in Mexico. In 2016 she received the Society for Conservation Biology’s La Roe Award as a leader in translating the principles of conservation biology into real-world conservation. This lecture is sponsored by Chicken of the Sea.